14th November - Supermoon today and ... more Saffron! The moon looked glorious last night, glowing huge and golden in the sky, but tonight, nary a glimpse as the skies are covered by thick clouds. Never mind, at least we could enjoy the sight yesterday, even if it was one day away from being at its fullest. This is the closest the moon has been to the earth since 1948, hence its huge appearance as it rises. Harvests this week have been decidedly on the thin side, but yesterday morning we doubled our saffron harvest in one go!! 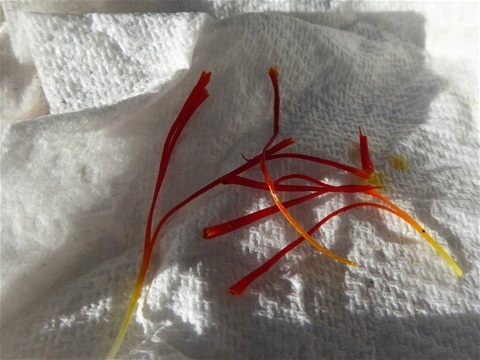 It has to be picked with dry fingers to avoid the yellow colour staining your skin ... which is a bit of a waste of course ... but the stamens were huge and bright, which bodes well. 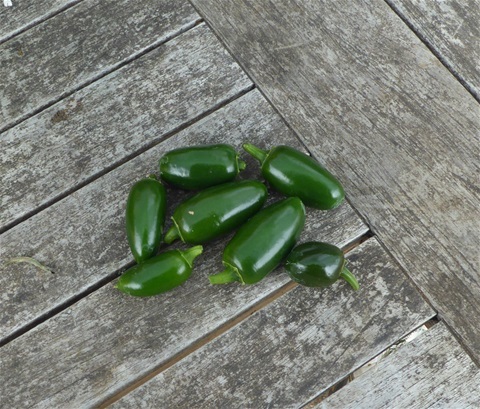 We have enough now to use for a very small paella or a couple of tiny saffron rolls, which is cause for celebration as we didn't expect any at all this year! The corms will now grow their leaves and will get a little feed of chicken manure pellets in the morning to help them with this, and I look forward to them bulking up further before they go back to sleep again in the Spring. And that, as they say, is that! I have resisted bringing home food we shall not finish this week, as from Friday we shall be away on holiday for two weeks, so don't want anything languishing in the fridge during our absence. If we have wifi I shall share some photos, and normal service will be resumed from 5th December. We have both been working hard to get all the seasonal work done at the plots and in the garden before we go. A couple of frosty nights last week finished off the remaining flowers, and they have been pulled out, chopped up and added to the compost bin, mixed with some shredded paper. 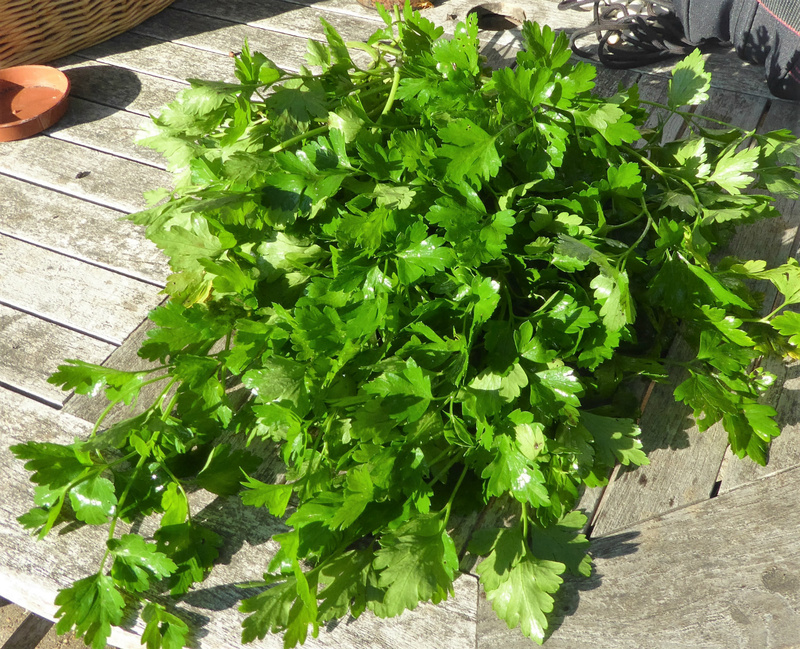 This afternoon, between the rain showers, I took out the begonia corms from the hanging baskets at home and put them in the greenhouse to dry, planted up one basket with pompom daisies, and potted up the spider plants that have been in troughs by the back door this Summer. 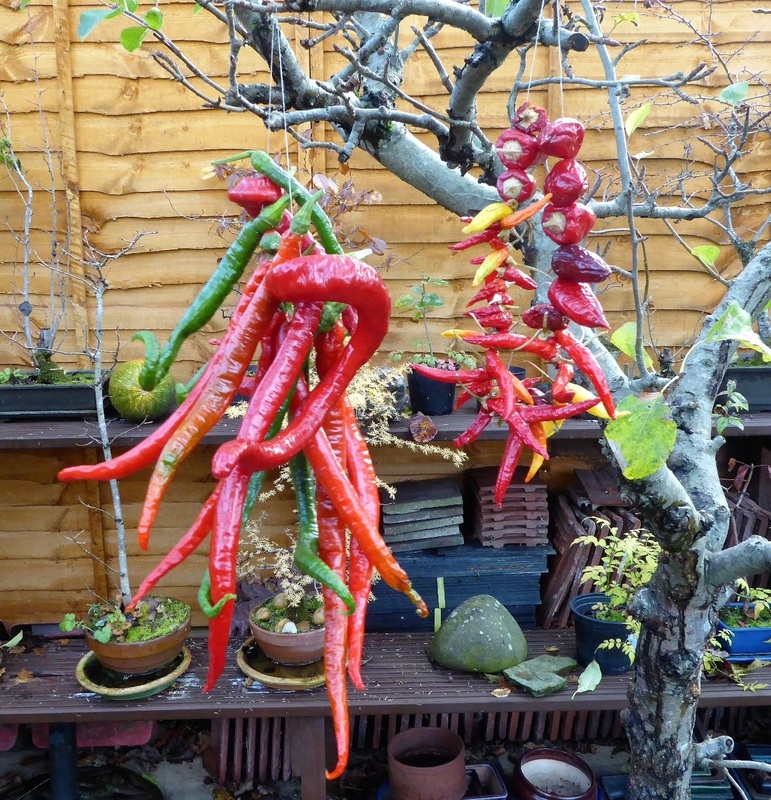 They have made really good plants and I am keeping them in the greenhouse to use again next year. 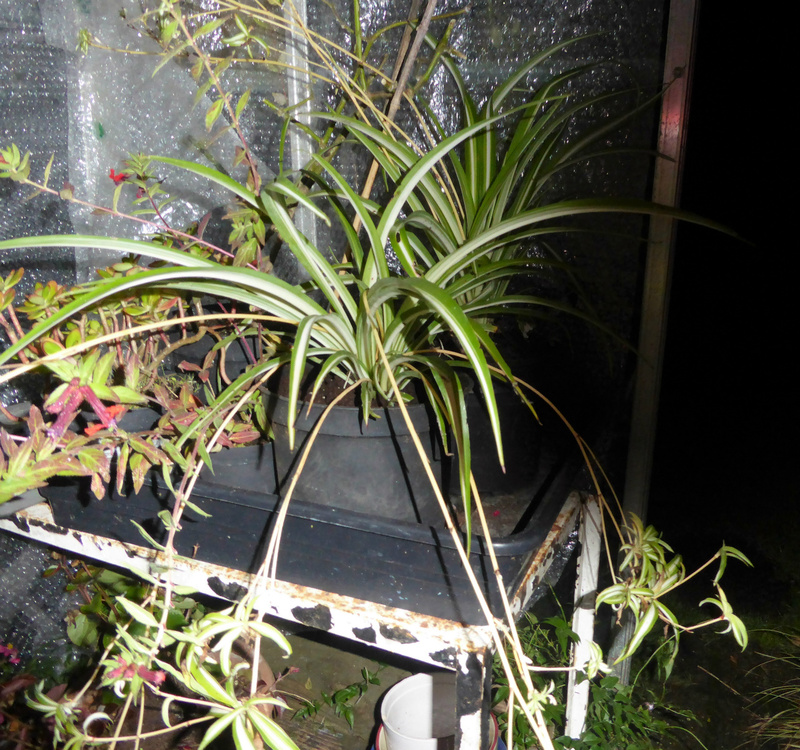 I have just been down to the greenhouse in the dark to take a photo (Still no sign of the moon through the clouds) so that you can see the new baby plants that are growing on the end of the arching stems. While I was in the greenhouse, I checked out the cuttings of pink marguerites I took three weeks ago. Yes, I know it was dark but I had my torch, and suddenly remembered they were sitting on the staging at the back. They look pretty good and seem to have grown a little bit, so I guess they have roots. They can stay in their nursery pot for a while yet. The plan is to grow them on to give enough plants for a good display next Summer, both at home and by our seating area on #146. 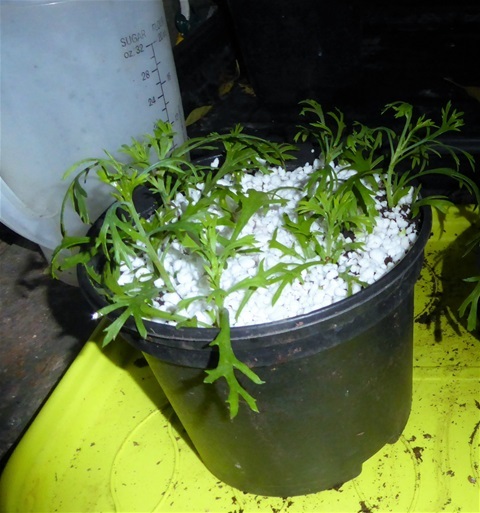 The original plants are also in a large trough in the greenhouse so that I can take more cuttings in the Spring to go with these ones, and also to share with friends. They came from the bargain bin at a Garden Centre, 50p for a tray of six plants, and after a good trim and a feed, have been in flower continuously for months... what a bargain indeed! Our lemon and calamondin trees are also now in their winter quarters, sitting inside the big glass kitchen doors. They were sadly neglected this Summer as they were pretty much out of sight, and I completely forgot about them until this week. 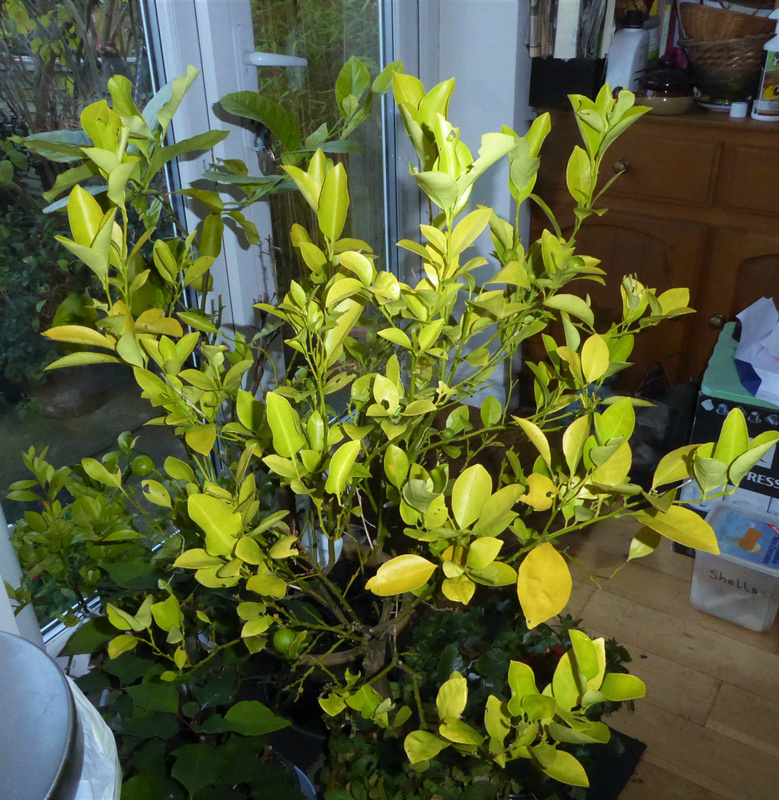 The leaves are a pitiful shade of yellow, although they do have green fruit on them and more flower buds forming too. I gave them some Summer feed this morning in the hope that it will help green the leaves up quickly: let's hope so! A few centimetres of rain this week made the ground nicely moist again, so we covered two of the manure-blanketed beds on #146 with black plastic yesterday. This should help keep them warm and ensure they do not get completely waterlogged. The worms like the extra cover too. We have left one bed uncovered to see what difference this really does make. This is the bed that will have courgette plants in it next year, so if it does end up very wet and soggy there will be time to deal with that before the plan go in around the end of May. All the seeds saved from climbing french beans and runner beans are now packed up and labelled, I am already getting itchy fingers wondering what to sow when we come back from holiday. 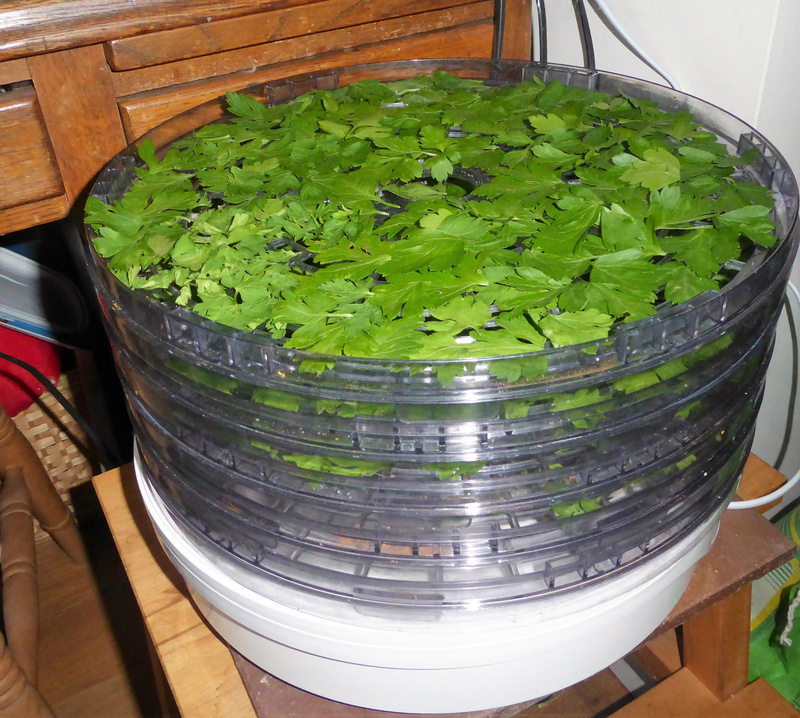 Top of the list are peas for pea shoots and rocket for baby leaves. There will just about be space in the greenhouse for them!! 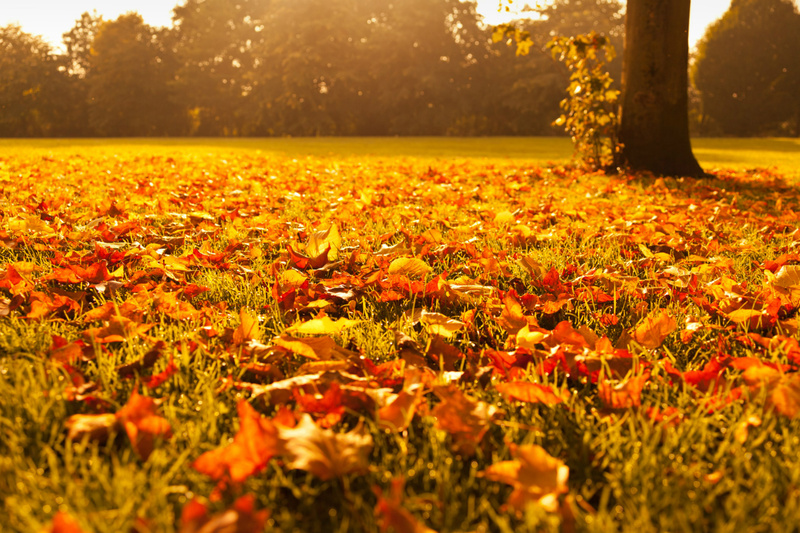 Autumn is progressing very slowly this year. There are still a lot of trees that haven't even started to change colour yet, and with us being away for the next fortnight I think we shall miss the main event so... here to finish this week is a photo I took this time last year in the park early one morning! Thank you for reading my blog, and I shall be back for 5th December. Who knows, it might be snowing by then! 7th November - About Turn!! 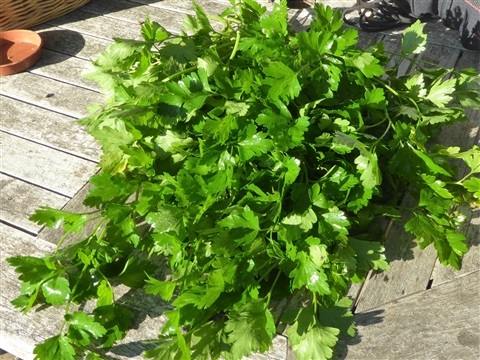 Last week it seemed like Summer was still with us, and then overnight the frosts arrived and I seem to have spent most of the week cutting and chopping blackened plants for the compost bin!! Much more seasonal and although it was a little sad to pick the last of the dahlias, it was also kind of good to embrace the Autumn weather. The dahlia tubers are staying in the ground for a little longer.. apparently the cold weather makes sure they are properly "asleep" for the Winter and don't start growing again until Spring. 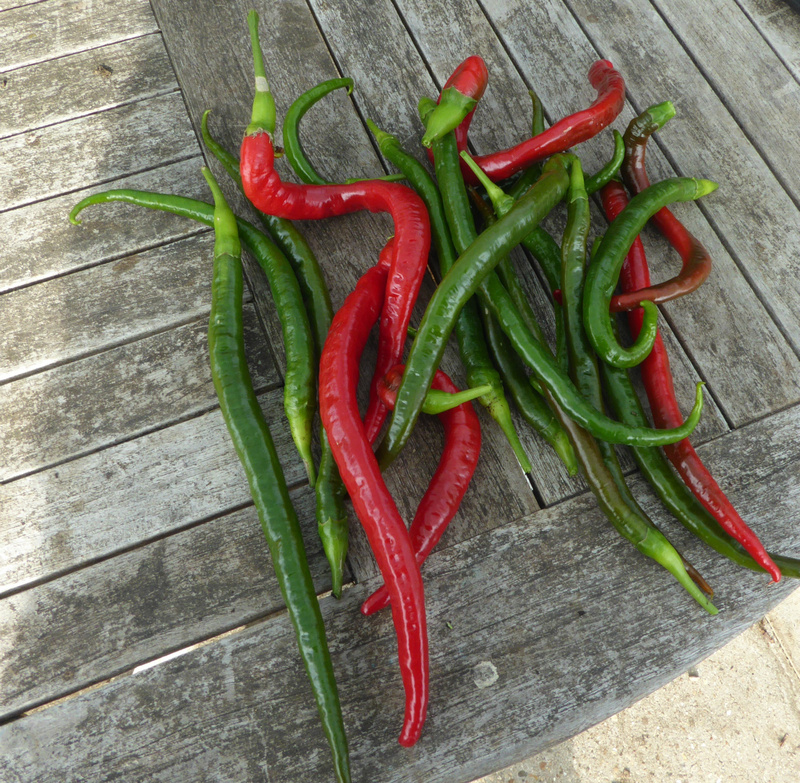 Harvests are far fewer of course, but.. here goes with Harvest Monday for this week! The chilli plants in the giant cloche are protected enough to cope with a couple of degrees of frost, but the shorter days seem to have called a halt to new flowers. 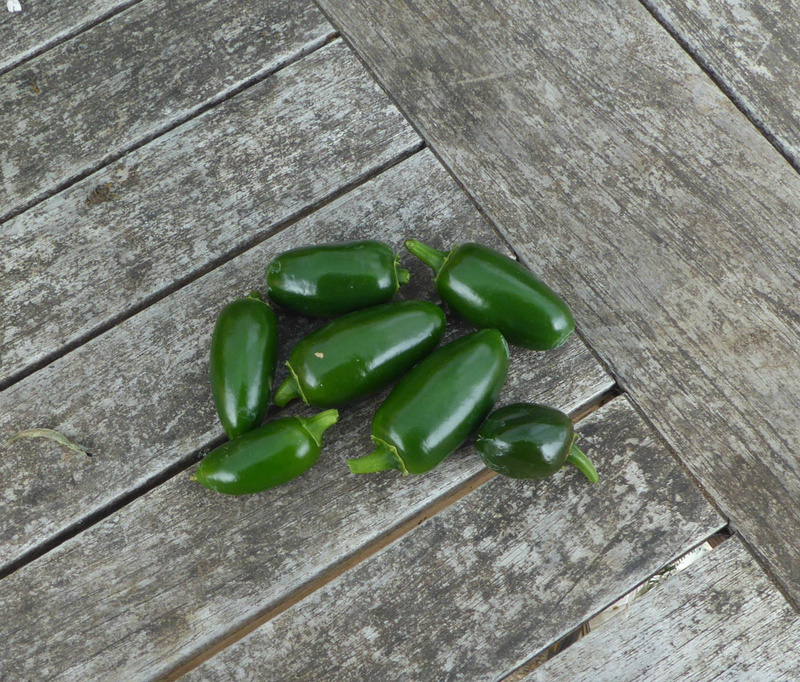 Joe's Long has been amazing ... just look at their size ... and there were a few jalapenos left, which will be going in the freezer to use as and when. Freezing them will mean they stay green and I do like their fresh flavour. I shall pot up the plant and bring it home to the greenhouse. Hopefully this will mean an earlier crop next year, if I can keep it alive of course. There are still plenty of carrots in the ground. At the moment I am just pulling these as needed. 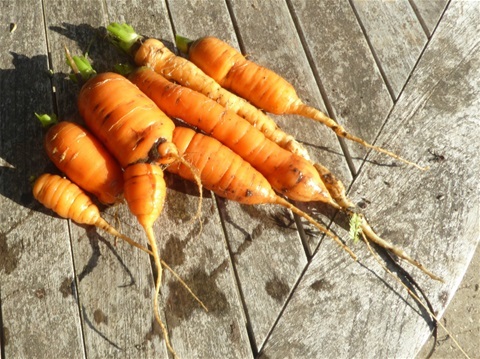 They are all sorts of shapes and sizes, no carrot fly thanks to the enviromesh, and they certainly are full of flavour. I am sure it is not wishful thinking that home grown carrots taste better than those from the supermarket! This week's lot were used in a slow cooked lamb curry, added just half an hour before the end of the cooking time to ensure they retained a little texture and a good orange colour. And that, with the addition of a lettuce which I forgot to photograph, three more strands of saffron and some sage, was that! Luckily we have also been able to eat from our stores: potatoes, onions, shallots, cherry tomatoes in oil, piccallili, dill pickled cucumbers, tomato-based cooking sauces, french beans, runner beans, cauliflower, apples and pears, as well as mixed tomato chutney and bramble jelly. All good! 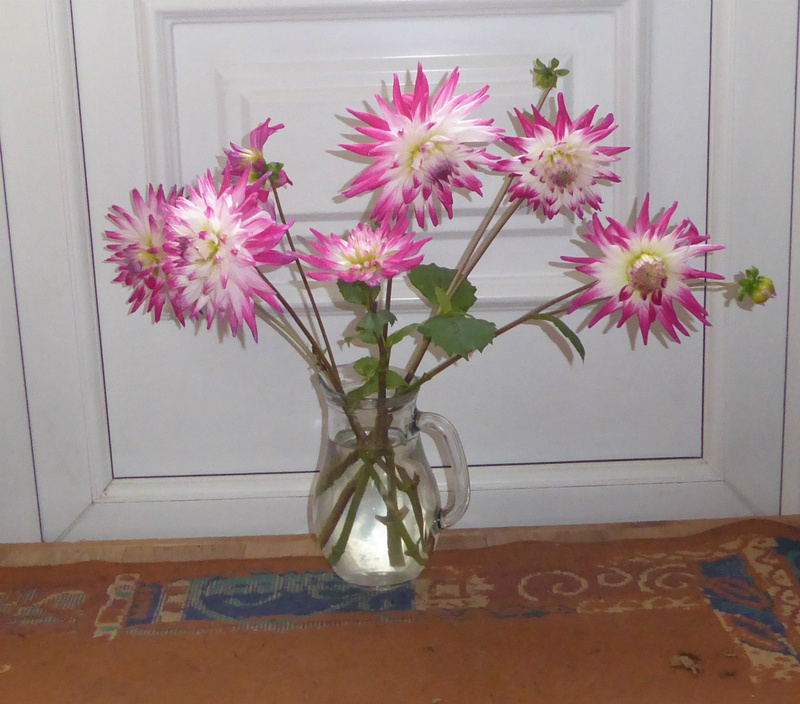 Non-edible harvests this week included the last of the dahlias, cut before they were frosted, and very good they looked too. 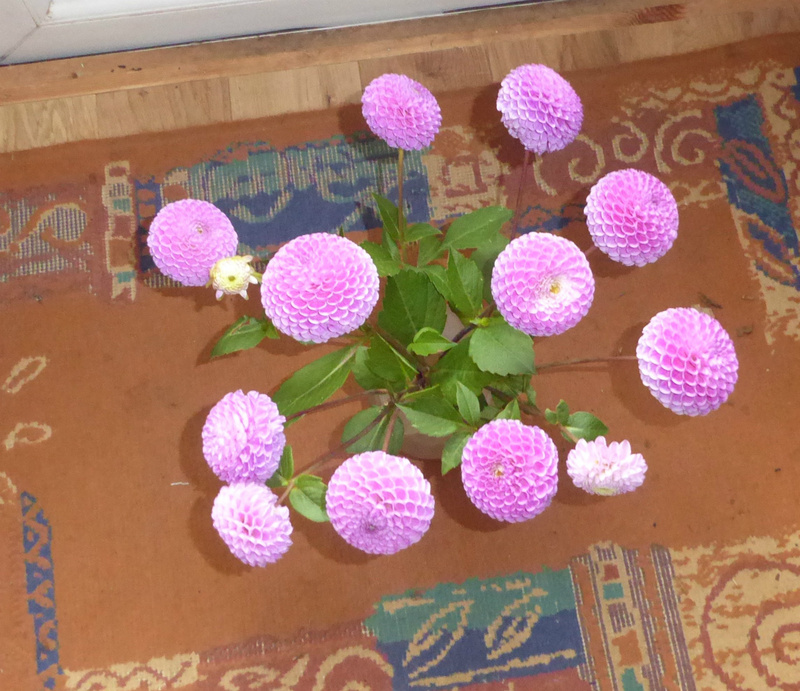 They have been a success again this year, and we are already planning what to grow next year and looking out for some larger pompom varieties. The perfection of the small purple ones has been a delight and some goodly sized ones as well would be just great! I did notice though that the new maroon ones had very skinny stems that barely supported their flowers, and totally collapsed in the rain, that the Bishop of Llandaff flowered very late and were very short too and that the scarlet cactus dahlia flowered poorly this year due to lack of food! The other side of this is the enormously tall pink and white cactus variety that went from strength to strength, thoroughly enjoying the occasional feed of tomato fertiliser and a good soak every now and then. The large white flowered ones held up much better this year as I removed flowers as soon as petals started to distort. The main thing I learned this year is to keep them all well dead-headed, well watered and fed, and then flowering stems are much longer. 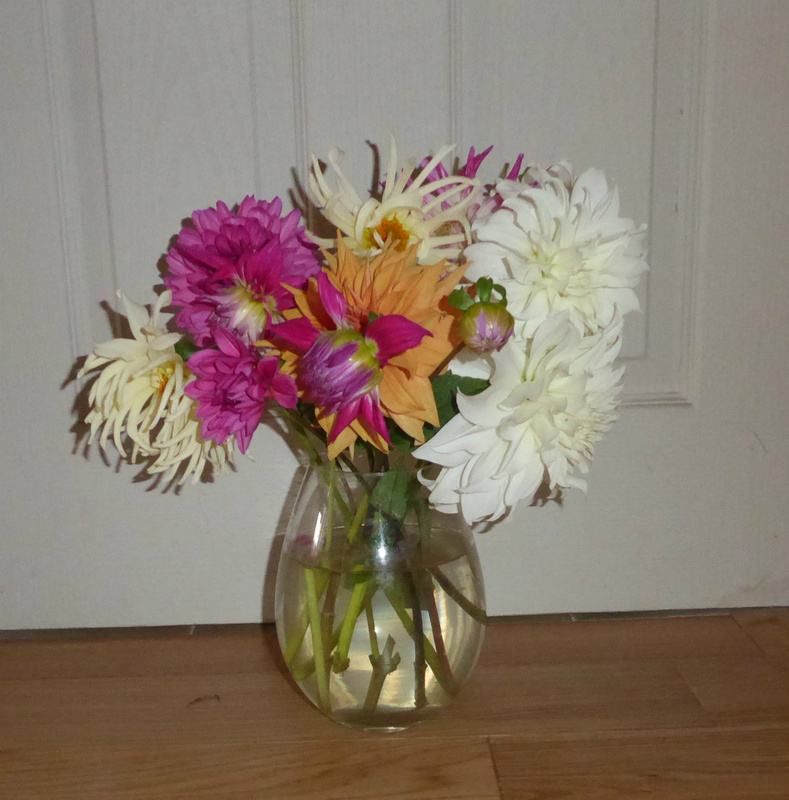 By the end of the season last year there was barely enough stem to get in a vase, but just look at them this year!! The large flowered begonias have given an impressive show this Summer too, but now, like the dahlias, it is time for them to rest and gather their strength for next year. The corms are drying off in the greenhouse at home, and as soon as the remaining top growth has dies back fully, they will go in some dry compost for a couple of months. They are tipped over on their sides to make sure any remaining sap drains away from the corms themselves, to reduce the chance of them rotting in store. I do like this time in the year, putting everything to bed for the Winter. It gives time to look back over the year, enjoying the produce stored, to remembering flowers grown as well as consider lessons learned from what has not gone quite so well, or even been a bit of a disaster sometimes! Planning for next year takes ages, and it is great to have to time for this. The plots are not ignored though, as there are still plenty of crops growing that need attention, and of course weeds never seem to stop unless we are in the grips of a freeze! The unusual weather has certainly confused some plants though. 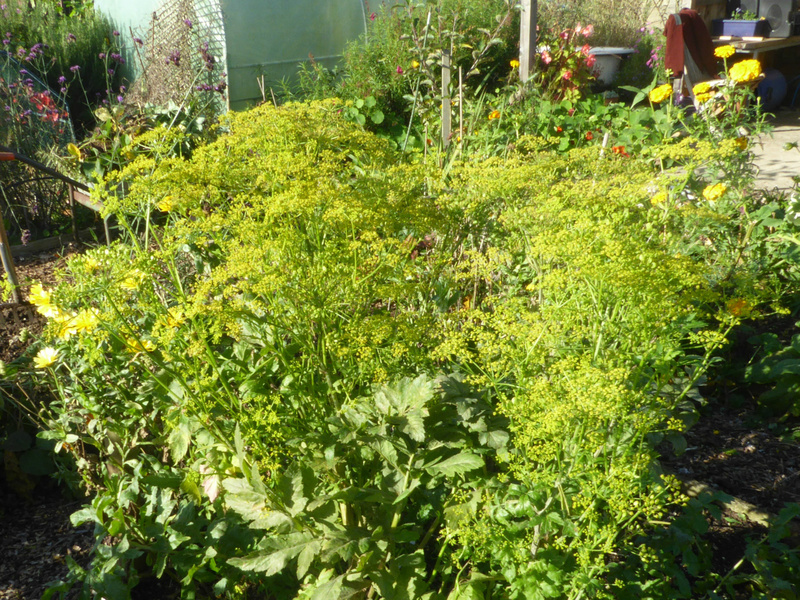 I have never ever had parsnips run to flower before the start of next Summer, but just look at these two! Silly things have lost the plot completely! 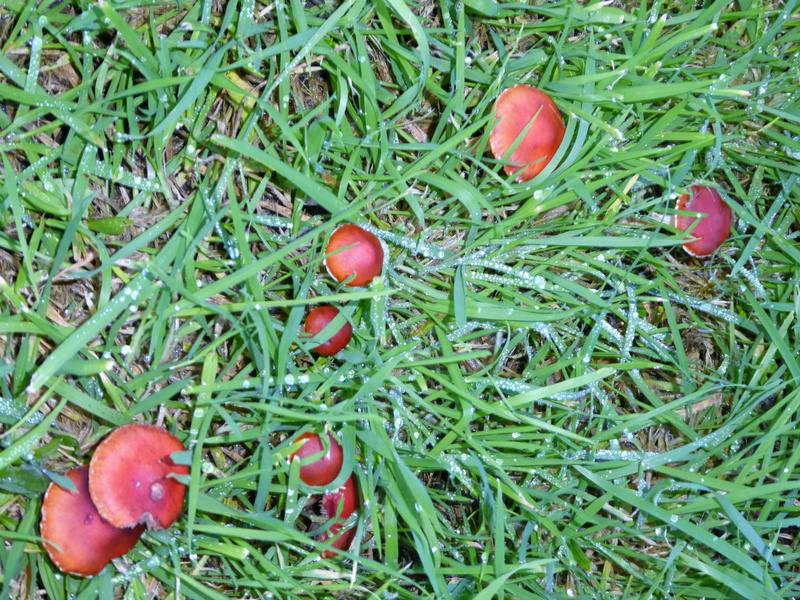 Autumn fungi are appearing, mostly growing on the woodchip imported for the paths. This patch has been growing on the woodchip underneath the grass, and very bright they look too in the late sunshine. I leave them be, as they are harmless to the surrounding plants and the colours of their caps look beautiful, even the plainer brown ones. A few weeks back there was no space to plant the Spring Cabbage and Perpetual Spinach out on the plots, so when the tomato plants came out, I planted these in the giant cloche. They were really too close together, but I planned to move them once their bed became available on #145, so wasn't too worried. In a fit of over enthusiam, this bed was given a blanket of manure and a black plastic cover last week ... they won't want to be planted into the manure as they like very firm soil! However, they are thriving in their partial cover, so there they will stay. 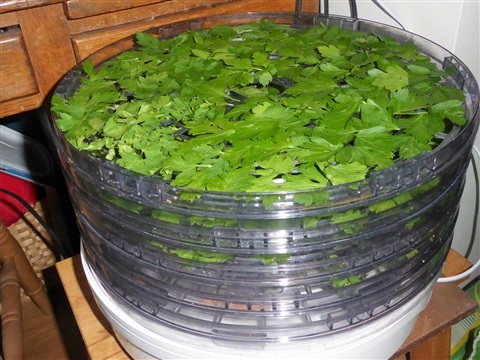 If they do get too squeezed, alternate plants can come out and be eaten at any stage. 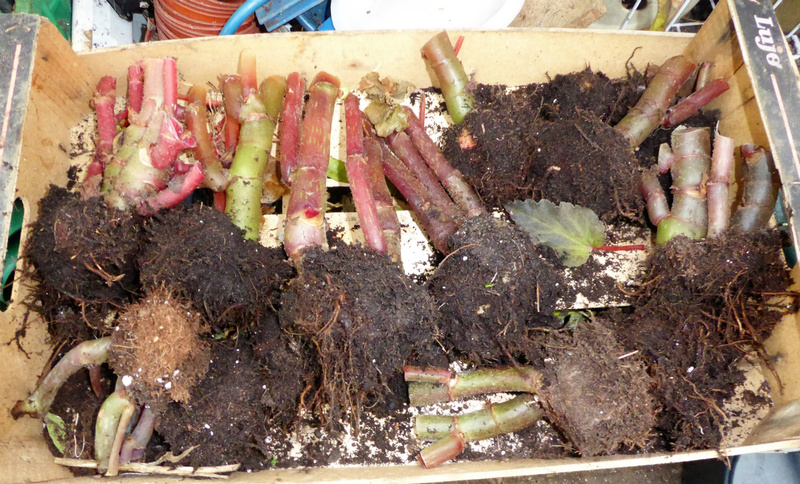 At the same time as planting the cabbages and spinach, the Red Mustard went into the mini-tunnel. I grew it like this last year and the plants continued to crop for months, so I have planted twice as many this year and, as long as they are watered from time to time, should not bolt and grow flower stalks. 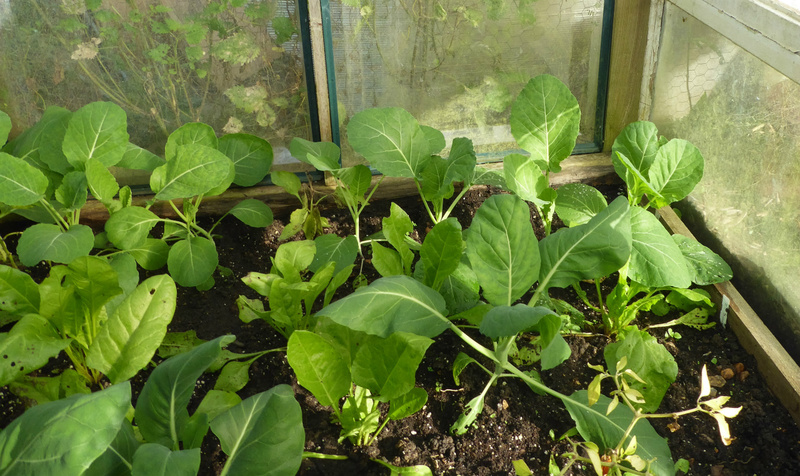 The pak choi are still doing well in their too, and we have eaten quite few of them already. 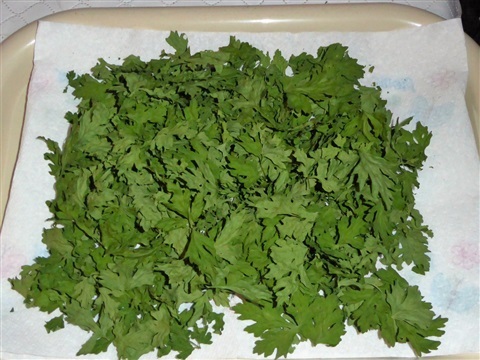 The leaves get some small slug holes in them sometimes but are still OK to eat after a good wash. Growing them under cover has protected them from flea beetle damage though: nice when a plan goes as hoped! Plot #146 is much more orderly now, with the frost blackened flowerss cut down and composted, weeds mainly out and manure on the beds that need it for the planned crop rotation. This is the bed where the runner beans were, minus a rather large crop of dock plants that were revealed when the sticks were taken down. Early brassicas are planned for here in the Spring and they may need some added lime. 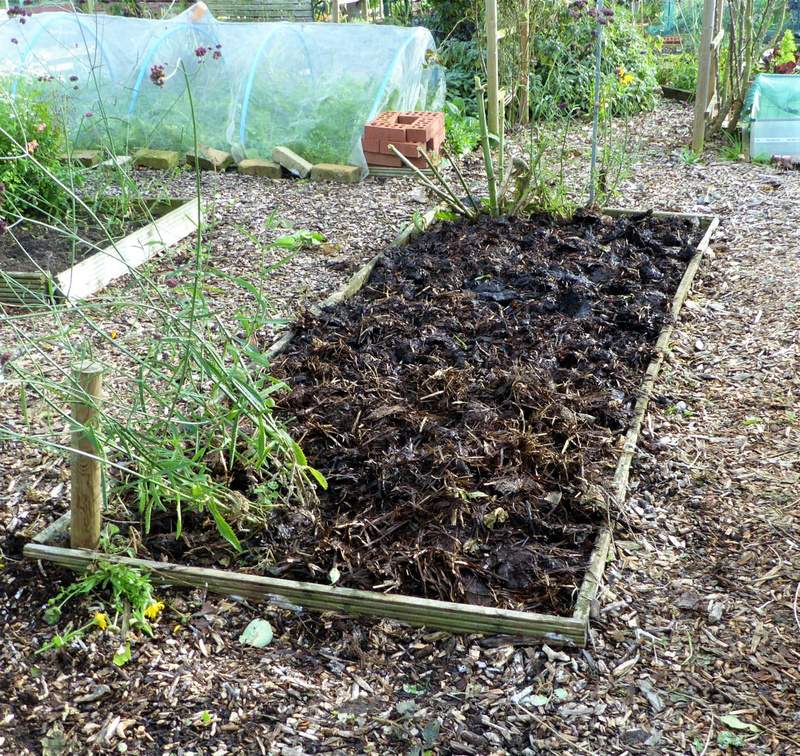 Putting this on the soil at the same time as manure would lead to an unfavourable chemical reaction, so the manure can sit there all Winter to weather, and the bed can then be prepared for the cabbages in the Spring. The verbenas will be moved to the flower bed where the sweetpeas were this year. And here to finish are some new flowers. 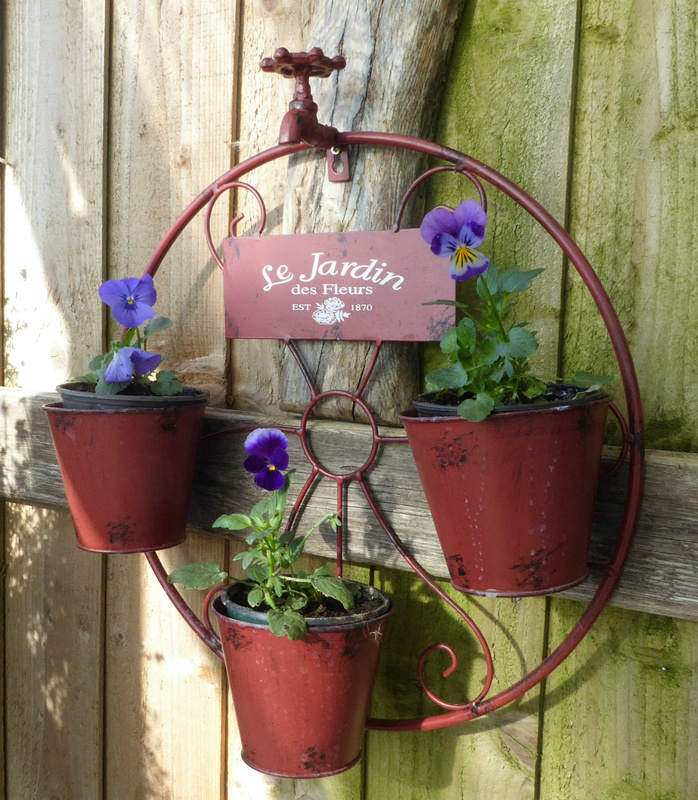 These violas have been growing on at home in a seed tray out in the garden, and are just right for the small pots here where the french mariglds have been all Summer. I hope that in the Spring they will bush out to give weeks of pleasure. 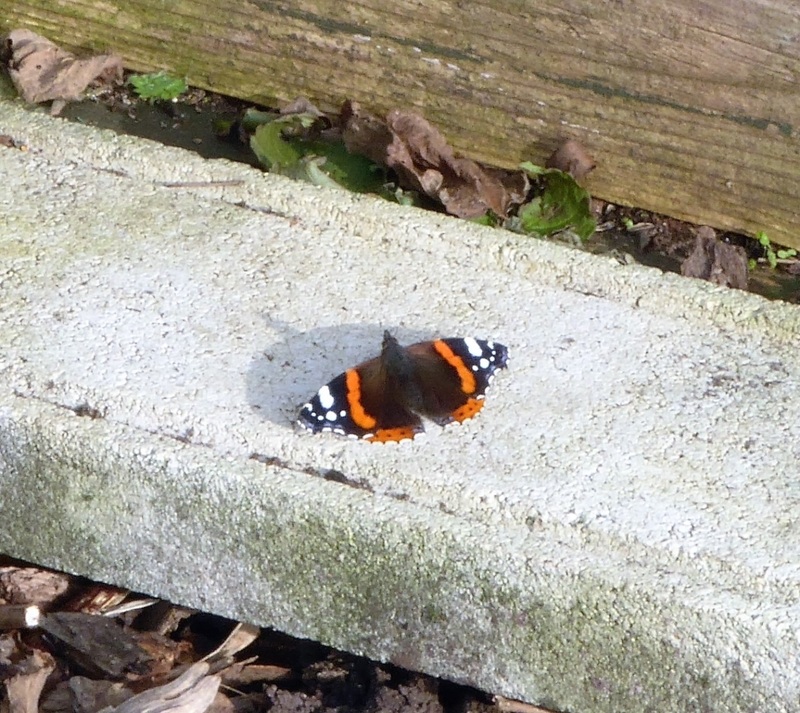 They ougth to be very sheltered here on the back wall of our covered area, which gives them the best chance.